This post provides a summary of our school’s solution to managing our mobile devices and apps. It is appropriate for both school owned and students owned devices and deploying both free and paid apps. It is also a very simple way of easily maintaining a record (i.e. an asset register) of all your computers and devices including their serial number, model, OS’s etc and additionally being able to perform actions remotely to them. In our situation we have school owned iPads, ASUS netbooks and iMacs in classes, a range of iPod Touches and iPads through BYOD, and MacBook teacher laptops. We wanted to monitor school owned devices and be able to deploy apps to school and BYOD iOS devices. This will outline what we do to achieve it. There are probably better ways, but when you are just a small school with no technician and the principal assumes the role network manager, service manager… you find something that saves time, you go for it. Is it perfect? No. Has it saved time and centralised control of devices and apps? Yes. Any advice is welcomed. Create your school Apple Store Apple VPP account. We created two school email addresses (and Apple IDs) for this purpose, one for the VPP Manager (e.g. vpp@yourschool.school.nz) and one for a VPP Facilitator (e.g. vpp-fac@yourschool.co.nz). The VPP Manager gives the authority for Facilitators to purchase apps for the organisation. This could be an existing email/Apple ID but we created another specifically for this purpose. The Facilitator Apple ID is the one you used to make Apple VPP purchases and we also use it for our Apple Push Certificate registration. Create your free Meraki Systems Manager account. Just use your normal school email address (i.e. principal@…). When you have access to your Dashboard, navigate to the MDM (Mobile Device Management) section and to Add devices. Download the software installers for Windows and OS X and also note down your Network ID for enrolling your iOS devices. Tip: Don’t use a name based email address (i.e. nick@…) as these do not always have a life beyond the user who may not be around for ever. Create and set up your Apple Push Certificate. Step by step instructions are provided via the Meraki Dashboard (go to Organisation then MDM) and the Meraki Knowledge Base. Tip: Use your VPP Facilitator Apple ID for this purpose. Set up your OS X and Windows devices by installing the downloaded software from Step 2. Once installed, the devices will appear in your Meraki Dashboard under Monitor and then Clients. After a while all the machine’s details are visible in the list and you can then explore the additional functionality of Meraki. This is all you need to do for your OS X and Windows environments. Tip: For OS X machines, this software can be installed and deployed when you re-image a machine. Rather than plodding around and installing this one by one, just wait for the next re-imaging. Tip: Unfortunately, for Windows machines, it’s not so simple as it doesn’t work from an image and you need to remotely/manually install it. Use Apple Configurator to create and set up your school owned iOS devices. There is plenty of online support for this as well as the the built in Help. We have one profile for all devices which includes a range of free apps and settings etc that are common to all devices. Tip: One thing we do in Apple Configurator is to assign each device/iPad to a ‘user’. The user names are sequential (i.e. ODS iPad 1, ODS iPad 2 etc) and have a user profile picture (the school logo). What this means is that when you turn on/wake up your device, it displays the school logo with its unique name – a really simple way of labelling devices. Tip: To keep the iOS device management separate from other uses for our computers, we set up a new user/account on one of our laptops exclusively for using Apple Configurator. This keeps it clean and tidy and avoids clashes between personal Apple IDs etc. Tip: If you don’t have a syncing dock/cart for your devices, get yourself a decent USB hub that allows you to configure multiple devices at once. Being restricted to do only one or two at a time is not good! Create an email address for each of your iOS devices which will be used for their Apple ID. Super easy in GAFE by uploading the template .csv file with multiple user info. Tip: Keep your emails aligned to your device name e.g. if you named your devices iPad 01, iPad 02 etc then logically emails will be ipad01@…, ipad02@… etc. Tip: An extra step, not absolutely necessary but in the long term will save time, set these email accounts up so they forward all emails to a catch-all address. We use the VPP Facilitator email to receive all the forwarded emails. Once you have prepared, supervised and assigned your iOS devices we need to setup their unique Apple ID. The best way we have found to do this is by manually completing the process on each iPad. This way you can avoid the step of having to enter in any credit card details. Simply go to the App Store on the iPad and find a free app you want to download (or any free app as you don’t actually have to download it). When prompted for an Apple ID, follow the prompts to create one, using your email address created in the previous step. You need to authenticate the email address, so log in to your catch-all Apple ID email and complete the process. Tip: As already mentioned, when setting your Apple IDs, make sure you uncheck the Apple News and Announcements, New on iTunes and Other iTunes Offers, always enter the same security questions and answers, DOB etc. Now we need to enrol the devices in Meraki Systems Manager. Open up Safari on the device and navigate to m.meraki.com and follow the prompts to enter in your Network ID and install your Meraki profile (if you want to deploy apps to student owned devices you need to complete this step on those devices too). Once this process has completed, the device will appear in your Meraki Dashboard under Monitor and then Clients. You can then edit the device details by adding tags, owners etc. Tip: There is also a QR code in Meraki Systems Manager to enrol devices. Tip: Tags are really important as this is how you deploy apps out to devices. Take the time to think about how you will tag them. We tag them predominantly by room, as our iPads are based in rooms but also tag them individually for finer deployment as required. Now you are all set to go and manage your devices and deploy apps both paid and free. To deploy free apps, simply go to your Meraki Dashboard, MDM and then Apps followed by + Add new. Search for and then add apps and assign them to iPads using tags. Meraki will push these apps out to the assigned devices. The devices will automatically prompt for the Apple ID password and the download will commence. If the process doesn’t work for any reason, you can re-push out apps to the devices at any stage. To deploy paid apps, purchase them through the Apple VPP site. We exclusively use Managed Distribution which enables us to assign apps to individual Apple IDs/devices. That way we retain ownership of all apps, allowing us to revoke and reassign them as needed, even to BYODs. Once a VPP purchase is confirmed, it will appear in your Meraki Dashboard under MDM and then VPP. Then you can assign it to an Apple ID, add it to your apps list and push it out to the devices. Tip: On the devices you can also go to the App Store app and find your list of purchased apps (i.e. those assigned to you). They will be listed there and you can initiate the download manually. That’s the basic outline of what we do. Hopefully you may find it useful. As mentioned, any advice as to how we can streamline the process further would be great! Had a good discussion recently with my old principal at Russell Street School. We were talking about where to next for the school in regards to elearning and supporting infrastructure. Like many schools, Russell St is exploring the potential of iPod Touches and iPads to support learning. An interesting question was raised in relation to the current and future software agreements. For those of you who are not sure what the agreements are all about, the Ministry of Education negotiates on behalf of schools in NZ, licenses with software vendors, to provide schools with computer operating systems, office suites, anti-virus and web filtering software at no cost to the school. Before the question is posed, let’s take a moment to look at the anticipated changes to the tools that students and teachers will learn with, moving away from desktops and laptops to smaller mobile devices and increasingly BYOD. …it is likely that mobile devices with internet access and computing capabilities will soon overtake personal computers as the information appliance of choice in the classroom. When the next software agreements are negotiated, will the increased use of mobile apps be recognised and included in the deal? A school has trialled the use of iPads and iPods in their school, has realised the potential, seen the impact on teaching and learning, and has aligned their strategic plan and infrastructure purchasing around this. The purchasing over the next 3-5 years will take the school to a position where these devices out number the desktops and laptops in the school. They would like students to be using iMovie, GarageBand, Pages, Numbers & Keynote on these devices (totalling NZ$54.95) i.e. the mobile app equivalents for the same applications the school receives now for no cost under the current software agreements. What do you think? The solution of course is complex and is simply not a case negotiating with the Apple reseller here in NZ. Issues already surround licensing of any apps for NZ schools with a lack of volume licensing among other things, ably outlined in this blog post by CORE colleague @warrenhall. I know that plenty of you out there will be saying things like Android… Google… open source… and fair enough to in a number of respects. The point is, new software agreements should reflect current and planned usage and recognise what is clearly an increased use of mobile devices in NZ schools, especially the iPad and iPod Touch. Last term saw a focus on building vocab understanding and use with all students across our senior team based on the results of our PAT Reading Vocab test which weren’t quite as sharp as we wanted. One could take the traditional route to building vocab which is generally done through the spelling or word study classroom programme but to be honest the old spelling notebook home on Monday and back by Friday for a spelling test with word activities in between does not really engage me or my students (and also is not pedagogically sound according to this). 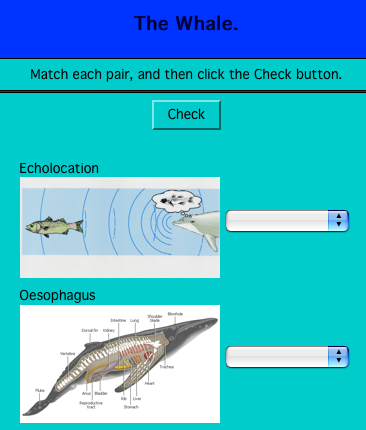 So we have used JMatch, JCloze, JCross and JQuiz this term as part of the literacy/reading programme. Students selected reading material based around our context of ecological sustainability, read and discussed the text, drafted and then created the hot potato quiz, published it to their eportfolio and then it’s ready for others to solve, including teachers, peers and parents. 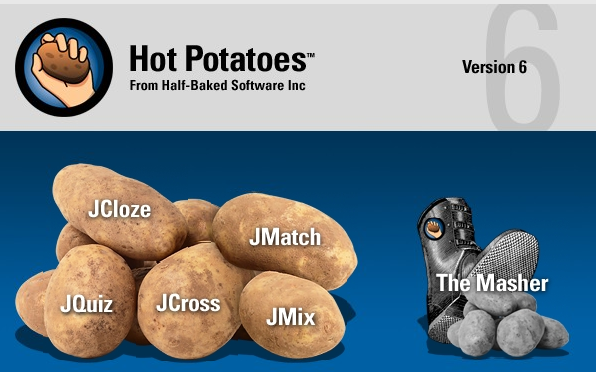 Here are some to try: JMatch, JCloze & here, JCross and a JQuiz. The last example shows the flexibility of Hot Potatoes to embed web content, such as a YouTube clip, to add interest or for future projects where the quiz questions relate to the embedded content. As we all know there are plenty of web based tools for creating similar puzzles and quizzes online and then linking to or embedding them in your site. However the degree of customisation you can have with a Hot Potato makes a great all round solution. Admittedly, it is not without a few issues, the main one being that within the save dialogue box on a Mac, you can’t save directly to a networked folder. This creates an extra step when students save to their folder on the network. Also, making the files available to link from the student blogs, required the files to be FTP’d to a directory on our school’s web site due to our blogging provider, and all file hosting sites that I tried, not allowing .html uploads and links. Neither are big issues, but it would be great to see the saving and exporting directly to a networked folder, or even FTP’ing to a remote server, made possible. Download it and give it a go. Thanks to Frank who blogged about this funky little tool for creating photo galleries on your own website. TiltViewer is a free, customizable 3D Flash image viewing application. A simple upload to your website and a quick configuration of your Flickr username and tags and you are all set to go. Feel free to have a play on my gallery right here. Click images to zoom-in, click again to zoom-out. Click the ‘reload’ button (below the image grid) to load a new set of images. Click the ‘flip’ button (bottom-right of a zoomed-in image) to see image details. Best of all is a right click to select fullscreen mode. Cool. I feel a TiltViewer gallery coming to our school site very soon. Timez Attack is the “ultimate multiplication tables video game” brought to you by BigBrainz. Available for both Mac and Windows, you can download a free version to use or invest in the fully featured version or school wide licences. Have a go and it is indeed a completely different way to practice your multiplication basic facts. But to be honest, pricing at US$10 per year per 3rd Grade student (other grades are free) or a US$795 site wide licence for a large school, it ain’t cheap. Wordle has been blogged about on almost every educational technology/elearning blog site you can think of. I wont go into describing what it is and how it works because that has already been done. Go here, here, here, here or here, to link just a few, if you are not familiar with this tag cloud tool. Just out of interest I pasted in my eFellowship research plan with the following result. My purpose was to find out whether or not my core concepts would indeed be the words that were enlarged as their frequency assumes more importance. 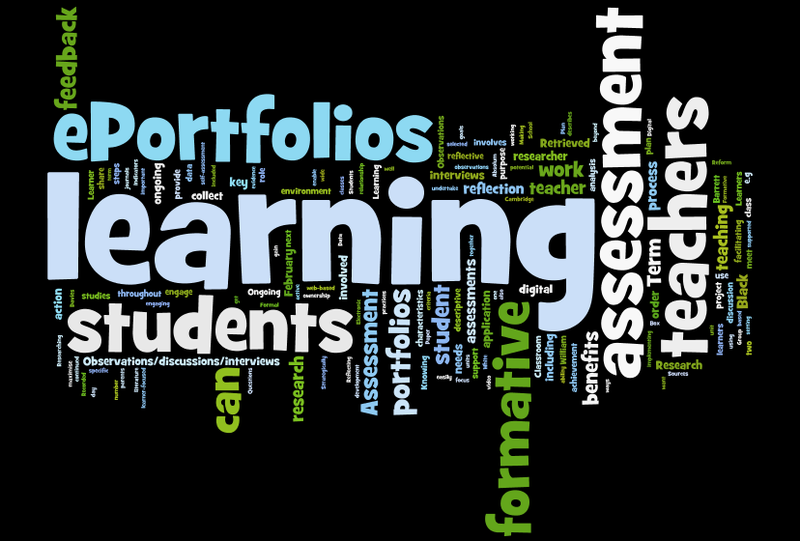 With my research question being, What are the formative benefits of eportfolios? I think that these seven key words do highlight this and more specifically, the teacher‘s role and the impact on students. All interesting stuff. It will be interesting to see what my literature review turns up when it is also pasted into Wordle. Will it compliment those key words above or contrast? If you are a teacher or regularly run workshops for other teachers in using new technologies and software, you can be sure that you have spent hours putting together how-to sheets or screencasts using a variety of different tools. Included are Apple’s well known screen capture keyboard shortcuts or Grab, or a selection of other tools including iShowU, Snapz Pro, the more Web 2’y tools like GrabUp, Skitch or Screencast-O-Matic. 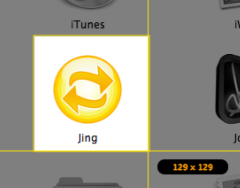 Jing is another tool and a free download. It is able to capture your screen, or a selection, as an image or movie and upload them directly to a location of your choice for embedding in to blogs and other web pages, or simply to store online for future use or sharing. 1. Select the option from the Jing menu. 2. Drag the cross hairs to select the screenshot area. This is one of Jing’s best features – the fact that all of the selection box lines extend right to the edges of the screen. 4. ..and then annotate with text, arrows, drawing or shapes and select from uploading to your free screecast.com or flickr, ftp’ing to a remote location, saving as a file or copying to the clipboard. Further options include uploading to use as link (URL) or to embed in your blog, the option used throughout this post. 5. The file will then upload and inform you that the code for embedding on your site is ready for pasting in. Very handy. 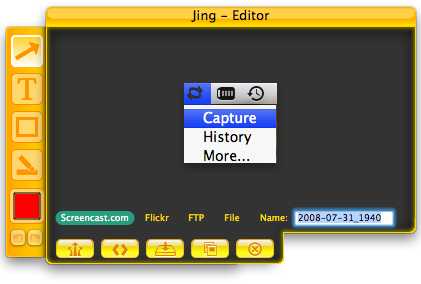 If you choose to upload them to your free trial screencast.com account (easy to create from the Jing preferences – no need to visit screencast.com) you are able to upload 2GB of movies and images and have 2GB of bandwith available per month. More info on that here. I have found that giving teachers and students screencast how-to movies instead of paper step-by-step guides has reduced time spent on preperation for teaching these skills as well as reducing the time spent going over skills with individual teachers. Just make them easily available on the web available and remind people how to access them.